Hey everyone. Final thing I have install before engine install is Forte's hydraulic clutch. I must be installing this thing wrong, as it's way off of alignment from the fork. Can someone guide me to the landing strip? Looks like I've got the wrong bracket. Last edited by cv2065; 02-09-2019 at 05:19 PM. I think you are right Sigurd. Sent him a note already. I bought Mike Fortes external slave unit for my SBC 350 and TKO 600. My original Bell was a GM aluminum "stock" unit but could NOT get it to dail in to the Tremac specs. ( cheap China stuff?? ) SO, at the advise and generosity of someone much smarter than me, I went with a Quicktime bell and it dialed in Perfectly. But, the Forte bracket does not fit now. The Bells are just different enough that I need another one. Even a custom made one that Mike Forte is going to create for me and swap out the units this coming week. My experience with Forte is the same as with F5.... Excellent. Looks like he gave you the bracket for a QuickTime bell instead of the standard aluminum bell. Yours looks like this one. You can see the opening for the clutch fork is clocked around further than yours. Last edited by edwardb; 02-09-2019 at 06:47 PM. Thanks John. I'll have to make sure that Mike sends me that snazzy cover too. This version of the bracket didn't come with one. This is the setup Mike Forte installed for me. Interesting how that bolts up. Doesn't look like it uses the main trans to bell bolts at all? My slave looks a lot different as well. Mike has made several changes over the past 10 years that I've been following this. Some of us had to make modifications to get the older kits to work properly. Looks like Forte has redesigned his setup to use a bent steel mounting bracket instead of the aluminum billet parts. Interesting. Hey guys. So Mike Forte sent me out a replacement record speed. Thanks Mike! The bracket is on and looks great. Nice piece of aluminum billet. But I have a couple of questions getting this slave cylinder configured. 2. Also, any recommendations on how much to properly measure when cutting the slave cylinder pushrod to the right length? 1. Looks like machining wasn't quite finished on that rod end. Cut it off and smooth it out. 2. Some variations in setup so can't recommend a dimension. Just sneak up on it. Temporarily get the boot out of the way. Put the adjustment threads and jam nut in the middle of the adjustment range. Bolt the bracket in place on the clutch arm. Measure the depth of where the pushrod and end piece go into the slave. Measure the length needed from the edge of the slave to the clutch arm. Cut and try. Start long and shorten a little at a time until you get a little bit of slack with the TOB against the clutch fingers. My Heim/ball-end was the same way - a little nub on the end from where it was parted off during mfg. Just dress it off with a file. Paul's description of initial adjustment is spot on. At rest you want just a tidbit of freeplay in the linkage, with plenty of adjustment range available. Don't fret if you cut the push rod too short; you can easily make another from a 5/16"-24 bolt (check that's the right size for your rod end first). Just cut the head off an appropriate length bolt & away you go. P.S. Yep; I cut mine too short. Ok...so I think I have this nailed. I've got about 3/16" horizontal clutch fork play once all buttoned up. I do have a question around the vertical movement of the clutch fork. It moves probably about 3/16" up and down. Is this 'normal'? Here are a couple of pics and a video of the movement. Thanks again for everyone's input! Last edited by cv2065; 02-16-2019 at 12:39 PM. Yes that’s normal. The fork pivots on a fixed ball end bolt on one end and the throw out bearing in the middle. The fork to throw out bearing has clearance to so that it can free float a bit to guarantee alignment and figment. Looks good to go. I've got about 3/16" horizontal clutch fork play once all buttoned up. If I'm reading this correctly you have 3/16" from when the linkage is bottomed in the cylinder piston... move the assembly forward... and it contacts the pressure plate fingers? You could probably halve that to less than an 1/8"... you don't want the pushrod to fall out of the "cup" in the piston too far. The critical thing is that the throw-out bearing is not in contact with the fingers at rest. A 1/16"-ish clearance is plenty. 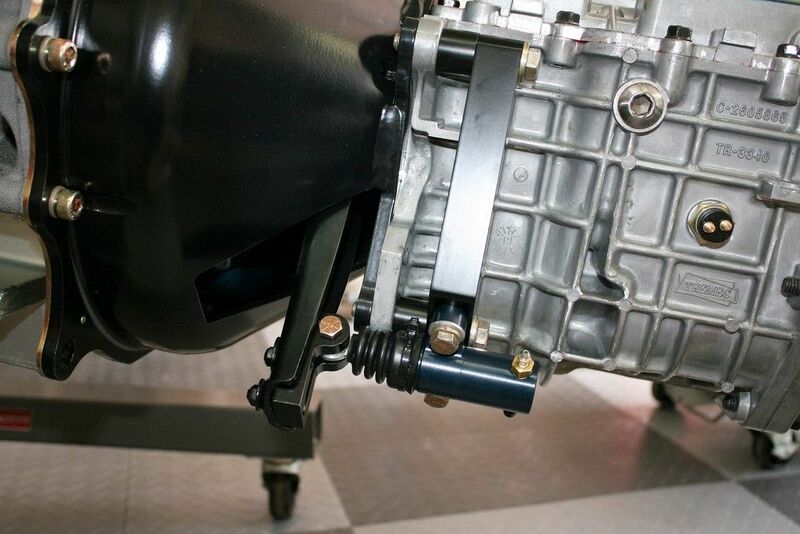 Any "extra" clearance will need to be made up for with clutch pedal travel. You’re reading correctly John. Forte recommends 3/16”. After tightening everything up, I’m actually about 1/8”, so should be good to go I would imagine.